Projects Abroad Jamaica brought some festive cheer to children this past Christmas through the annual toy drive, which saw 1248 toys given to underprivileged children across the country. The staff of Projects Abroad Jamaica was divided into 11 teams, each tasked with collecting a minimum of 230 toys from members of the local community, staff, volunteers, placements, host families and friends. The teams were aptly named according to the theme, “Give them a toy, spread some joy,” and included Ho Ho Ho, Santa Squaddies, Jingle Bells, and Krismus Cake. Ho Ho Ho ultimately won the challenge, collecting 654 toys for the children. When all the toys were collected, the teams and volunteers of the Care Program journeyed to the communities to ensure that each child received a toy for Christmas. It proved to be an exciting celebration not only for the community recipients, but also for the staff and volunteers of Projects Abroad Jamaica. 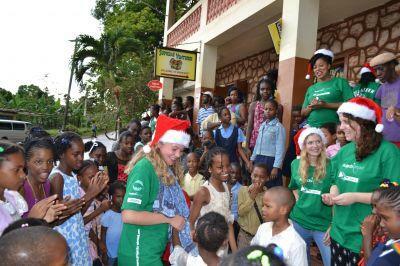 The event was marked by the Projects Abroad team and the children singing and dancing to Christmas carols, enjoying the cake and ice cream that was served and playing traditional Jamaican games. Thank you to everyone who donated toys to this worthwhile initiative and put smiles on the faces of Jamaican children!